From the folks who brought you the 18 hour boss fight, comes this: mass bannings! Square Enix has nixed a large number of players from online game Final Fantasy XI. Final Fantasy XI Boss Takes At Least 18 Hours To Beat? According to Square Enix, the company "discovered an issue that allowed players to create multiple items for certain treasures and rewards in areas such as Salvage and Assault by exploiting the game system." This "issue" was apparently a bug — and a bug that many players had long known about before Square Enix handled. 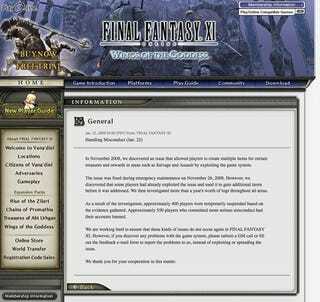 During an emergency maintenance on November 26, 2008, Square Enix fixed this "issue" and discovered that players had already taken advantage of it before, in Square Enix's words, "it was addressed." "As a result of the investigation, approximately 400 players were temporarily suspended based on evidence gathered," Square Enix stated. "Approximately 550 players who committed more serious misconduct had their accounts banned." Word has it that many of the damned and banned were long time FFXI players — perma banned, apparently.